In LotRO, there are a wide variety of usability issues with quests (that we won’t go into here), so it makes sense that they persist here to the map. In the game, the player can be tracking only five quests at once, which can be seen in the box that’s sitting on top of the lower left part of the map. On the actual map, there are tiny rings that represent where each quest takes place, or an area of color, depending on what type of quest it is. So you probably noticed the red and orange areas right above the quest box. That’s not too hard to pick out. But there are two rings located in the town of Bree. Can you spot them? Okay, now, can you actually identify which one is blue, and which one is dark green? Yeah good luck. The map itself is a little busy, so putting these extremely dull and hard to pick out rings on top of it is a terrible idea. Hovering over one of the quests makes the rings on the map very gently pulsate – from what you’re seeing in the screenshot to nearly translucent. Right, so they managed to build in an animation that makes it EVEN HARDER to spot where the quests are. Okay, maybe that’s an exaggeration – I appreciate their effort. A better way might be to have a glow pulsate around the quest marker instead? The idea for fixing this isn’t complicated – just make the rings easier to see. Heck, put some giant arrows pointing at the ring if you’re hovering over the quest title, that would be great. In the lower-right side, you’ll see the crosshairs along with a little tooltip with the location. Most of the time, these expanded maps are in big cities. Like Bree, in the center of the map – there’s another map for those details. But this one that I’m hovering over in this screenshot is essentially a random section of map. There’s no information scent here to let people know there might be something else to look at. Of course, pointing at it with your mouse isn’t exactly uncommon. Still, an icon or different styled text or dotted outline would make me happier about this. While the active quest box is in the same spot, the map title, zoom out help text, and compass rose are all in different spots here. Sure, this is probably a little bit more thematic. But it also introduces a problem where your quest tracker could be covering any of these things. And having that help text moving around on each page just looks goofy. I’d rather see a corner (or two) dedicated to consistently displaying this information. And, a dedicated back/up navigation button. Clearly, I’m not the only person who hasn’t immediately figured out how to go back a level, since there’s a sentence dedicated to that help text on every map. The quest tracker can be hidden, if you just want to look at the map. I wonder how frequently the maps are used in this way? Being a new player, I’m not sure. Regardless, making the quest tracker movable feels like the developers are just offloading the task of fitting everything on the screen to the player. That’s usually not a good thing. Especially in a case like this, where you know there can only be five items, that’s a problem that should have been solved already. If it was a hugely variable number, it might be a different story. But it’s not. And that’s just the world map. The mini-map in this game introduces its own level of frustration, but that’s another post for another day. As I said in the beginning of this article, I have very little experience with MMOs. 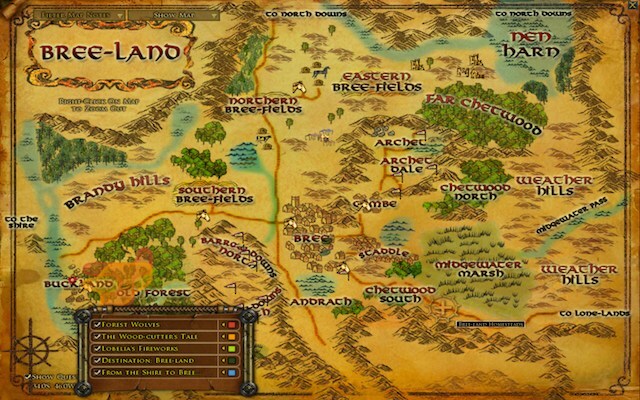 How do world maps compare in other MMOs? I know there are some seriously gigantic worlds out there, can anybody chime in with better/worse experiences? What would you nominate for the worst map ever? Lets discuss in the comments! This entry was posted in PC, Role Playing by mark d. Bookmark the permalink. Quest rings on the map don’t change colour – they flash on and off when you hover over the name of the quest in the list. So no need for colour coding.